Oaks Online Shopping Company is based in Essex, UK. The company is best-known for our large range of specialist outdoor and giftware websites and as being the wholesaler and distributor of some leading outdoor brands, such as Gerber, Live Fire and many more, as well as being the UK wholesale supplier of U.S 550 Paracords, Firecord and paracord bracelet making accessories throughout the UK and Europe. Whether you’re looking for gift ideas or useful tools, you’ll find all that you need from our portfolio of specialist mail order websites. From bushcraft equipment to sporting optics, we have literally thousands of great quality, unusual and attractive products, most of which you won’t find on the high street and many of which are totally exclusive to us. Or, maybe you are a business looking for a wholesale supplier of outdoor equipment? All products are tested for quality and performance before they can appear on our websites, and we take pride in offering our customers the very best possible service at all times. We are large enough to cope with the demands of very big wholesale or retail orders, yet small enough to care about our customers and their needs. We have large warehouses, where we aim to keep stock of everything we sell, to ensure you get a quick and efficient service. Looking For a UK Wholesale Supplier Of Outdoor Brands? If you are a company wishing to stock and sell some of the brands that we offer, please feel free to contact us to apply for a business to business account on one of our strictly wholesale supply websites. 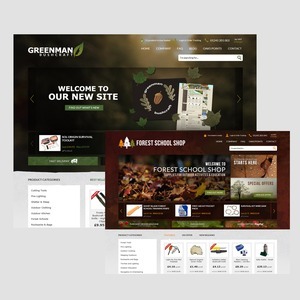 Although it certainly doesn’t feel like it – it’s been two years since we last revamped the Greenman Bushcraft website, so we thought we’d bring you a newer and fresher look and feel, but we have included a few extras, such a more straightforward ‘Customer Services’ area and ‘What’s New’ Section, along with a trade section for companies wishing to order in bulk. We have lots of plans for our BLOG over the coming months too, so you can expect to see many new articles appearing, and hopefully including some work from our customers. 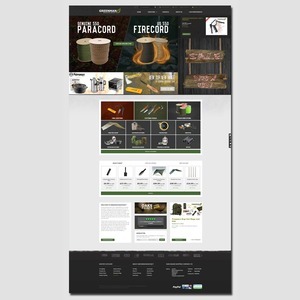 We hope you like the new site – the most advanced Bushcraft website we feel is currently running, and we look forward to hearing from you soon! It seems incredible to think it, but it’s been over three years since we re-designed our websites, and since then our company has expanded many times over. As a result of our expansion we’ve had to once again, redesign our websites to cope with the majority of new features and designs that we need to move the company forward over the coming years. We hope you enjoy using the new sites, and we’re confident that you will. As well as the new sites, and new features, such a mobile and tablet optimisation, we’ve introduced several thousand new products throughout 2013, so please feel free to have a good browse around the sites. Please stay tuned, as 2014 will be bringing many new and exciting developments too!